This is the discussion related to the wiki page	Project Verification Checklist. Hey, I'm on PeopleTools 8.47, and I've never seen object locking before. Is that new to 8.48 or 8.49? I think its been around in application designer for a while, at least all 8.4x versions but I could be wrong. 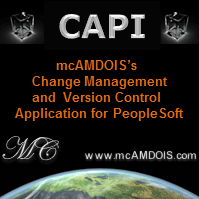 It does need to be enabled through application designer: Tools > Change Control Administrator. In the system wide options check the Use Change Control Locking and Use Change Control History check boxes. As this is system wide, if you turn it on in a development environment all users will need to start locking definitions in order to modify them, so you might want to first try it out in a sandbox/play environment. This isn't meant to be version control (even though the name suggests it). It is simply a way of tracking which developers are working on which definitions and it tracks a history of who has locked, modified and unlocked definitions which can be helpful. Check out this article on change control for more information too. Yes we use it. There are currently 4 developers working on Campus Solutions here. It was used a lot more heavily during the upgrade project when we had up to 15 developers all working on the same development database and more cases where a single definition was being modified by more than one developer. It think its useful as a auditing tool. It can tell you more about why someone changed an object (if they go to the trouble of putting in comments). Change control history can also be quite handy during patching when you want to know what changes have ocurred to a definition over time, not just the last person to update the object. Unfortunately it doesn't force comments (you can leave them blank) which means it is really up to the diligence of the developer to write why they are modifying a defintion.